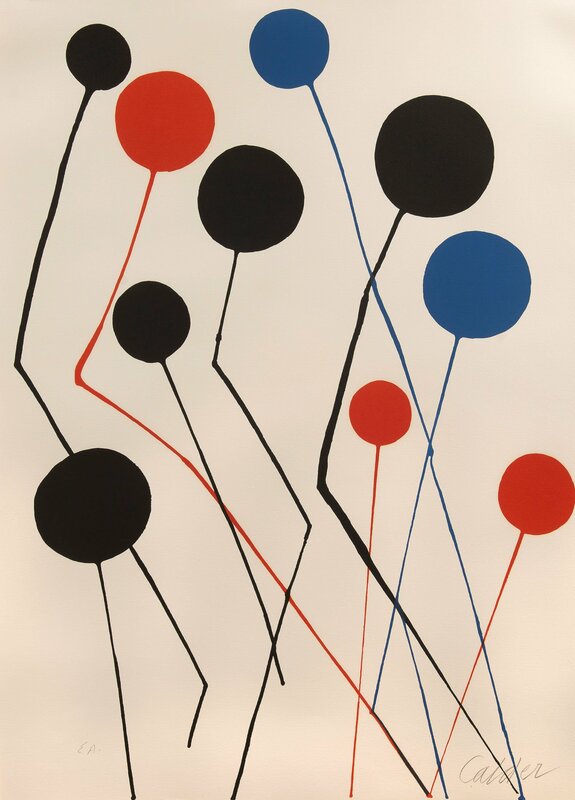 Here Calder has introduced the shapes and colours associated with the circus- balloons and bold primary colours- to produce a dynamic piece full of joy reminiscent of his sculptural mobiles. Alexander Calder was a monumental artist whose invention of the mobile tremendously influenced the art world. Mobiles are airy, hanging structures connected by wires and set in motion by the wind. Calder’s versions simply yet profoundly celebrated form and colour, and the joy of creating both. Calder was strongly inspired by the spectacle and wonder of the circus, constructing entertaining mobiles often accompanied by music. Producing dynamic yet playful mobile sculptures, Calder dismissed the formal structures of art and redefined its infinite possibilities. Alexander Calder (1898- 1976) was an American sculptor and draughtsman born in Philadelphia. The son and grandson of sculptors, Calder studied engineering and worked at various jobs before attending the Art Students League, New York, to study painting between 1923 and 1926. In 1926 he began to make small animated animals in wood and wire, which eventually became numerous enough to form a circus. 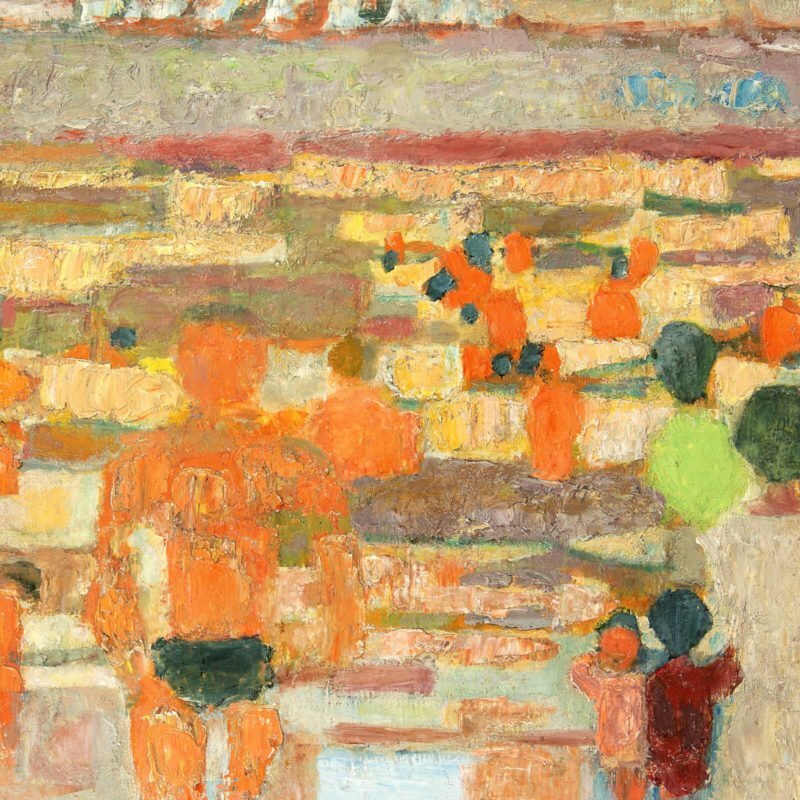 His first one-man exhibition was at the Weyhe Gallery, New York in 1928. From the years 1928 until 1933 Calder mainly lived in Paris, where he became friendly with Miró, Pascin and Duchamp, who influenced his aesthetic vision. At the same time, he began making children’s games, specifically puppets. These geometric forms stayed with the American artist throughout his life. In both his paintings and sculptures, he created work that was alive and free, with a three-dimensional sense conveyed by his connecting lines and hypnotic contours, like shown in his ‘Hynose’ series. Calder joined the group Abstraction-Creation in 1931. He started to make sculptures, to which Duchamp gave the name mobiles, which could be moved by hand or by small electric motors, followed from 1934 by pieces which were set in motion by air currents. The name ‘stabiles’ was later suggested by Arp for his sculptures which did not move. Calder lived mainly in the USA, at Roxbury, Connecticut, from 1933 until 1953, when he also bought a house at Sache (Indre-et-Loire). He was awarded the main prize for sculpture at the 1952 Venice Biennale and the First Prize for Sculpture at the 1958 Pittsburgh International. Calder died in New York.